PASADENA, Calif. (AP) — Space enthusiasts have been abuzz for days over whether the Mars rover Curiosity captured an extraterrestrial crash. On Friday, NASA declared the mystery solved. Seconds after the car-size rover parked its six wheels in an ancient crater, a tiny camera under the chassis snapped a picture revealing a smudge on the horizon. The feature disappeared in a later photo. Was it dirt on the camera lens or a spinning dust devil? It turned out Curiosity spotted the aftermath of its rocket-powered backpack crash-landing in the distance. It "was an amazing coincidence that we were able to catch this impact," said engineer Steve Sell of the NASA Jet Propulsion Laboratory, which manages the $2.5 billion mission. The nuclear-powered rover landed in Gale Crater near the equator Sunday night to study whether environmental conditions could have favored microbes. Its ultimate target is a mountain looming from the crater floor where mineral signatures of water have been spied. Curiosity performed a novel, complex landing routine. In the final seconds, the rocket stage hovered as cables delicately lowered the rover to the ground. After landing, it cut the cords and the rocket stage flew out of the way, crashing 2,000 feet from the landing site. 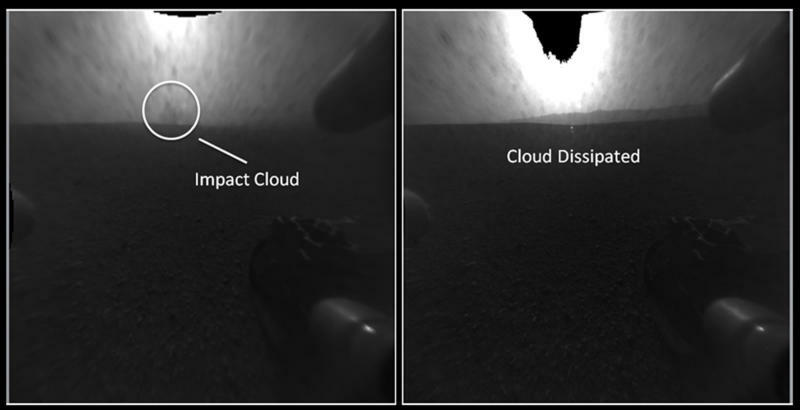 Speeding at 100 mph, the high-speed impact kicked up a plume of dust — which showed up in Curiosity's field of view. Curiosity was in the right place at the right time and facing the right direction, Sell said. Since the feat, Curiosity has returned a flood of pictures including a 360-degree color view and a low-resolution video featuring the last minutes of its descent. Over the weekend, it will get a software update, a process that will take four days. During the hiatus, stored data will continue to be downloaded. It will be weeks before Curiosity can take its first drive, zap at boulders or dig up soil in search of the chemical building blocks of life. The prime mission lasts two years. A preliminary reconstruction of the "seven minutes of terror" plunge through the Martian atmosphere revealed everything went as planned. Curiosity ended up 1 1/2 miles downrange from the bull's-eye target, probably because of tail winds and a late steering turn. 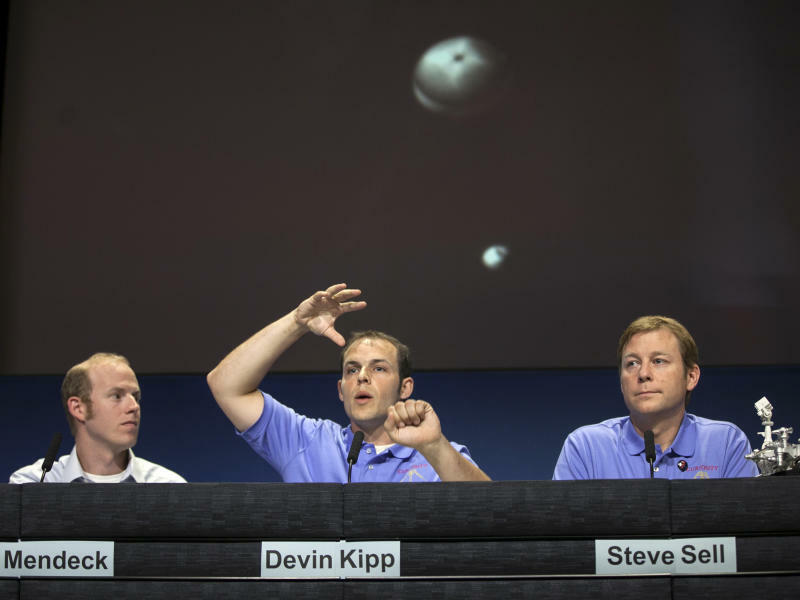 "We're still happy where we landed," said Gavin Mendeck of the NASA Johnson Space Center.